Combining the woodlots was done to attract a reputable contractor and to provide economies of scale ensuring a high quality job was done at a competitive harvesting cost. The three blocks comprised total of 25 hectares of ground-based harvesting. Dewes Contractors Ltd was engaged to undertake the harvest. The crew was fully mechanised with a feller-buncher, log processor and two extraction machines. The mechanisation improved safety by minimising the direct human-log-machine interface. Harvest production averaged over 200 tonnes per day which was excellent for small woodlot harvesting given the constraints of powerlines, country roading, fence lines and buildings. The crew completed each woodlot moving from block to block efficiently, minimising machinery establishment costs to the woodlot owners. The harvesting crew also completed some tidy up work for the forest owners outside of their contract including harvesting poplars and removing problem trees around buildings and yards. 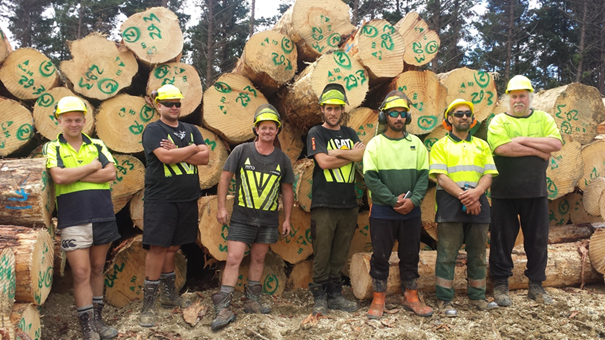 Dewes Contracting Ltd crew in front of big A-grade logs harvested as part of a combined woodlot harvesting project managed by the PF Olsen Gisborne team.